SNAFU! : The Borsuk IFV is developed under Poland's Amphibious Infantry Fighting Vehicle programme to replace the BWP-1? The Borsuk IFV is developed under Poland's Amphibious Infantry Fighting Vehicle programme to replace the BWP-1? We've seen the above vehicle but what filled in the blanks was this article via Jane's IHS. 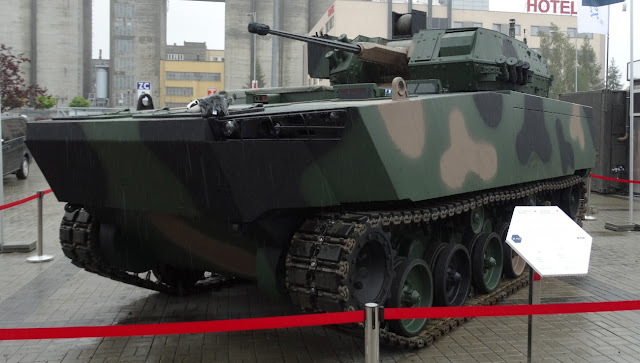 Huta Stalowa Wola (HSW) unveiled a Borsuk tracked infantry fighting vehicle (IFV) variant equipped with a ZSSW-30 remote controlled turret at the International Defence Industry Exhibition MSPO. The vehicle is being developed under the New Amphibious Infantry Fighting Vehicle programme to replace the BWP-1 (BMP-1) IFV in service with the Polish Armed Forces. The model unveiled in Kielce is scheduled to undergo driving and swimming tests in late 2017 and early 2018 before being destroyed in a mine protection test during the second quarter of 2018. Planning foresees assembly of the first Borsuk prototype in the third quarter of 2018. First. Poland is all about amphibious fighting vehicles. Second. The Poles have an aggressive schedule. This bad boy will enter service before the ACV. Can you say armor race?